Windows Vista can have trouble running some applications. There are several options for running Windows XP, from a re-install to virtual machines. Unfortunately the idea that you have - just swapping out the hard drive - will probably not work. Windows XP on the old hard drive is configured for all the hardware on that old machine. Booting it in the new machine will at best confuse the heck out of Windows as nearly all the hardware is changed out from underneath it at once. At worst Windows XP simply won't boot. You could certainly remove Vista and install XP. Just grab a Windows XP install CD, boot from it and proceed to install Windows XP from scratch. When it asks you to choose a partition, choose the one with Vista on it, and have it reformat the disk. Vista will be gone, XP will be in its place, and you can proceed to set up the applications you need. Be sure to keep the Windows Vista installation DVD that should have come with the new machine for use someday in the future. If the hard disk is big enough, you might consider a dual-boot option allowing you to boot your system into either Vista or XP. It's been a while since I've played with dual boot, but it's a viable option if you want to keep Vista around for other things. The approach I would take, however, is similar, but significantly more flexible. I would use a virtual machine. I also use a virtual machine to run Windows XP on my MacBook Pro running OS X. It's pretty amazing technology. So you can probably guess where I'm headed. I would leave Windows Vista installed, and create a separate virtual machine that would run Windows XP as a "guest operating system" in a window within Vista, where Vista is the "host operating system". That installation of XP could then run all of the applications that you care about. It's the best of both worlds, in my opinion. The virtual machine technology I'm using is Parallels Workstation for Windows. While I've not run Parallels under Windows Vista, they do list it as supported, as both the host operating system, and as the "guest" - meaning I should be able to try Vista in a virtual machine within Windows XP as well. Parallels does an excellent job of mapping almost all the hardware through to the guest operating system, with the most notable exception of 3D graphics acceleration, so no gaming, but most everything else is available and operates at near full speed. Does Linux have a role in the home? Linux is something more people are looking at to avoid issues they might have with Windows. Linux in the home is definitely getting closer. many people have had luck in running older programs on Vista by setting the properties on the program to run in compatiblity mode for XP. Your suggested solution of a virtual machine may be overkill. Vista allows an application to run in compatibility mode. 1. In Windows Explorer right click on the application file. Select the Compatibility tab. 2. Select the run in compatibility mode checkbox. 3. Select the mode from the dropdown list. Vista allows for compatibility with XP SP2 as well as modes going back to Windows 95 or forward to Windows Server 2003 SP1. BTW, if Vista balks at allowing an installer to run, a similar option from the install file�s context menu - properties will let it install. I suggest trying this before anything else. Regarding the dual-boot idea, as I recall, XP must be installed BEFORE Vista. I don't think you can add XP to an existing Vista installation and dual-boot. If you want to go virtual, VMware is by far the best answer today. 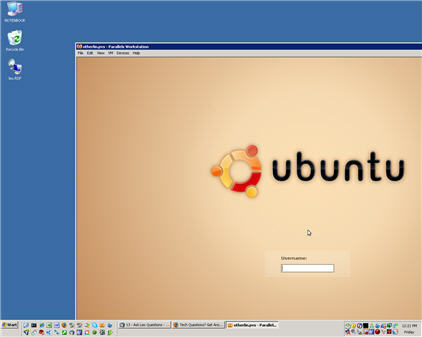 I've used it on both Windows and Linux hosts to run a wide range of guests (Windows XP & 98, Linux, NetBSD, etc). You will pay a performance penalty, but if your new system has a rich memory and fast disks, the net effect should be fine for most applications. How does Windows Genuine Advantage affect the dual-booting or Parallels Workstation idea? I thought the mantra has been "one XP, one computer". A fine question, and I think the specifics have yet to be determined. separately licensed copy of XP on the same machine in either dual boot or VM. environment it sees at the time. machine. But multiple OSs? It remains to be seen. WGA's ability to detect piracy is also in question once you install XP in a VM. Lots of open issues here. I don't think there are clear answers yet. Some good comments, but unfortunately, it is not as simple as loading the Windows XP disc and reformatting/reloading the software. Since I installed Vista, my computer no longer recognizes the hard drives UNLESS I am changing versions of Vista. XP reports that there are no hard drives....I have booted into the drives several times and so I know they are there....just XP no longer recognizes them. VISTA=TRASH and a waste of time. Completely useless OS until more companies are willing to spend the time to write drivers and actually support this new OS. It is by all means possible to install XP in a dual boot environment when Vista is already installed. It is also possible to do a clean install on top of Vista, though I would not recommend it if your machine came with Vista and has all hardware specifically designed for Vista. A virtual machine is a great option, but it seems kind of silly to use a virtual machine to run one version of windows on top of another. In my experience, however, 99% of the applications people say are not compatible with Vista will run under compatibility mode (see one of the above posts for more info on compatibility mode). So the most cost effective, simplest, and most all-around efficient option is to utilize the compatibility wizard. Vista does not run these programs -- even with compatability options. Those are just the ones I know about---there are also a bunch that it runs partially. For instance, if you choose to enlarge fonts in windows because you have a high-pitch LCD, most XP programs won't handle it well, and you end up with two sets of menus that overlap and created a jumbled mess. the model you are working with is the a1700n. Here is a listing of the a1700n motherboard specs. I found the predecessor model the a1600n, and here is a listing of the a1600n motherboard specs. As you can see the motherboards are the same. HP went through some rapid model no turnover after the introduction of Vista in the spring. First they changed the model with the introduction of Vista and then they changed the mobo and went to black cases. The motherboard has nVidia 6150LE chipset, and the lan is a 10/100 Marvell 88EC031. Here is a driver listing from the HP website. Try the nVidia LAN driver. Please note on the website that Service Pack 2 MUST be installed prior to installation of this driver. Only one problem with Vista......Vista! My OS died. Vista has given me nothing but problems on my HP media center. Compatibility with any game software is nearly impossible to accomplish. I installed NVidia's latest driver for the 8600 gfx series, and after restarting my computer, I got the "BSOD". My OS is completely fried, and I really don't feel like buying new restore discs.